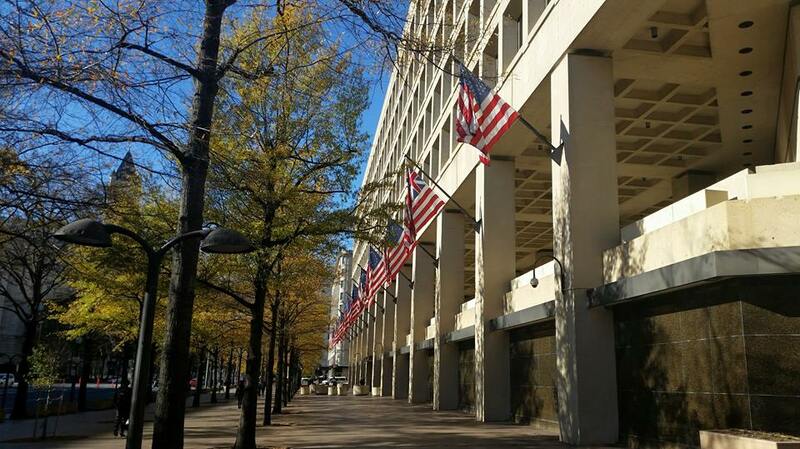 Most people walking by don’t even to bother to look up and notice the display of historic flags along the front of the FBI Headquarters building. But they should, because they tell quite a bit about the proud history of the United States. Located along Pennsylvania Avenue, also known as “the Nation’s ceremonial route”, are ten historic flags, flanked on either end by today’s 50-star flag representing the 50 states of the Union. And on today’s bike ride, I rode there to see the display that illustrates the development of the “Stars and Stripes”. 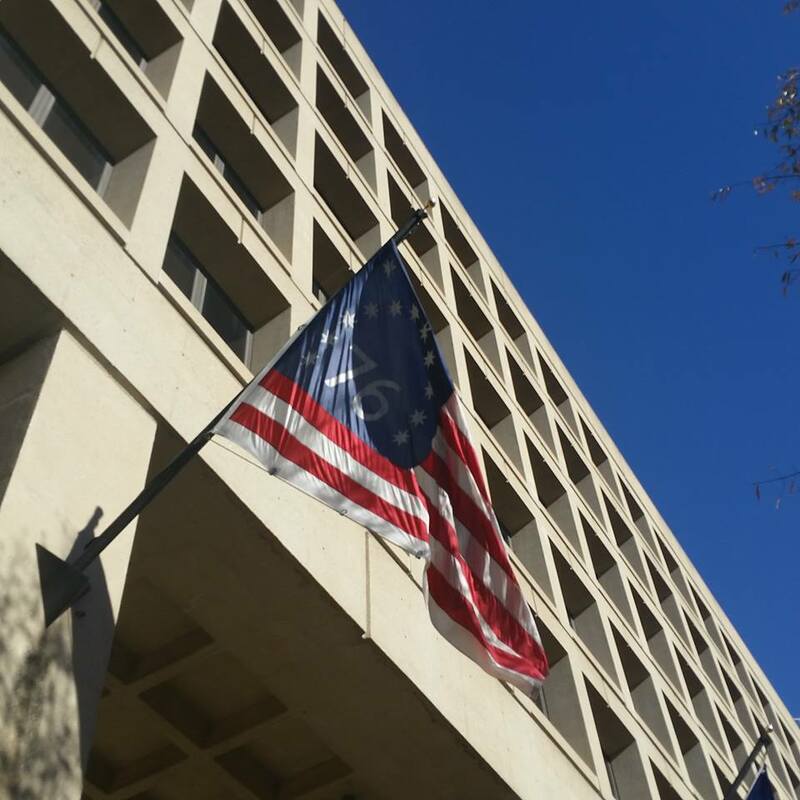 While I am not a vexillologist, I found all of the historic flags displayed outside the FBI building interesting and informative. The Grand Union, or Continental Colors, serving from 1775-1777, was first raised on January 1, 1776, on Mount Pigsah, Massachusetts, about the time the Continental army came into formal existence. It combined the British Union Jack and 13 stripes, signifying Colonial unity. The Flag of 1777, which had no official arrangement for the 13 stars. It was flown by John Paul Jones on the USS Ranger and was the first American flag to be recognized by a foreign power. The Betsy Ross Flag, 13 stars, designed by George Washington, Betsy Ross, and Francis Hopkinson. Although rarely used, it was adopted by Congress on June 14, 1777 – the official date of the holiday which is today known as Flag Day. The Bennington Flag, 13 six-pointed stars, allegedly flown August 16, 1777, over military stores at the Battle of Bennington, Vermont, when the Vermont militia beat back a superior British force. The Star Spangled Banner, 15 stars and 15 stripes, immortalized by Francis Scott Key in our National Anthem during the bombardment of Fort McHenry, Maryland, in September 13, 1814. The Flag of 1818, 20 stars, commissioned by a Congressional Flag Act that returned the design to 13 stripes and stipulated that stars be added for each new state. The Great Star Flag, 20 stars, designed by Captain Samuel Chester Reid, U.S. Navy, at the request of New York Congressman Peter Wendover and flown over the U.S. Capitol on April 13, 1818. This flag has the stars arranged in the pattern of a star, symbolizing the motto “E Pluribus Unum”: Out of many, one. The Lincoln Flag, 34 stars, raised by President Lincoln on February 22, 1861, over Philadelphia’s Independence Hall to send a message to Southern states, which were preparing to secede from the Union. The Iwo Jima Flag, 48 stars, which was commissioned in 1912 but came to symbolize our nation on February 19, 1945, when U.S. Marines raised it on Mount Suribachi after fearful fighting in World War II’s Pacific campaign. The 49-Star Flag, commissioned in 1959 when Alaska achieved full statehood. 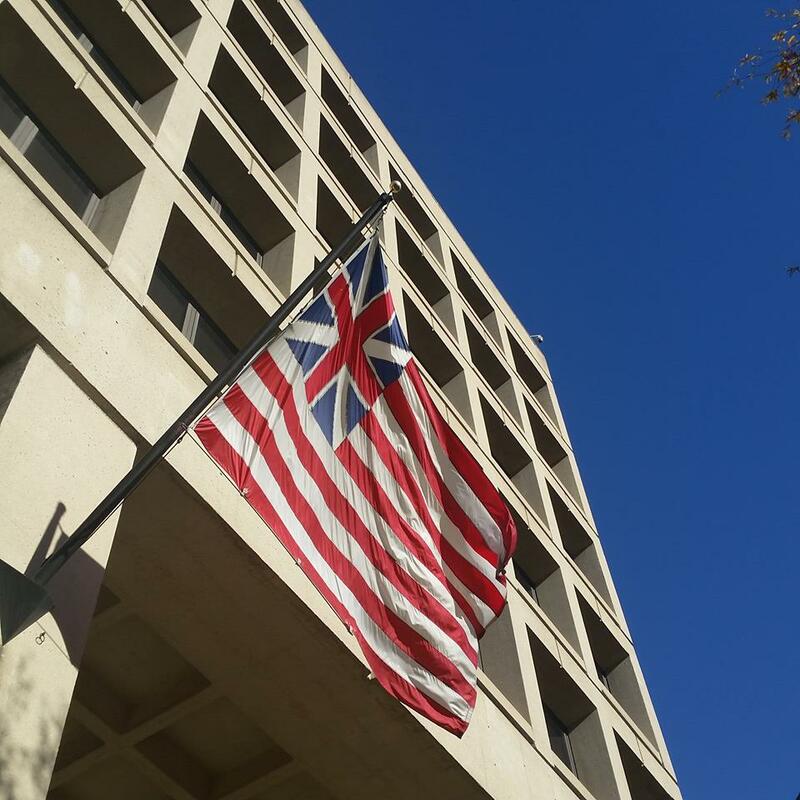 It flew for only one year, until July 4, 1960, after Hawaii achieved its Statehood and when today’s 50-star flag became official. And as I was leaving, I saw one more flag, on a flag pole around the corner of the 9th Street side of the building. 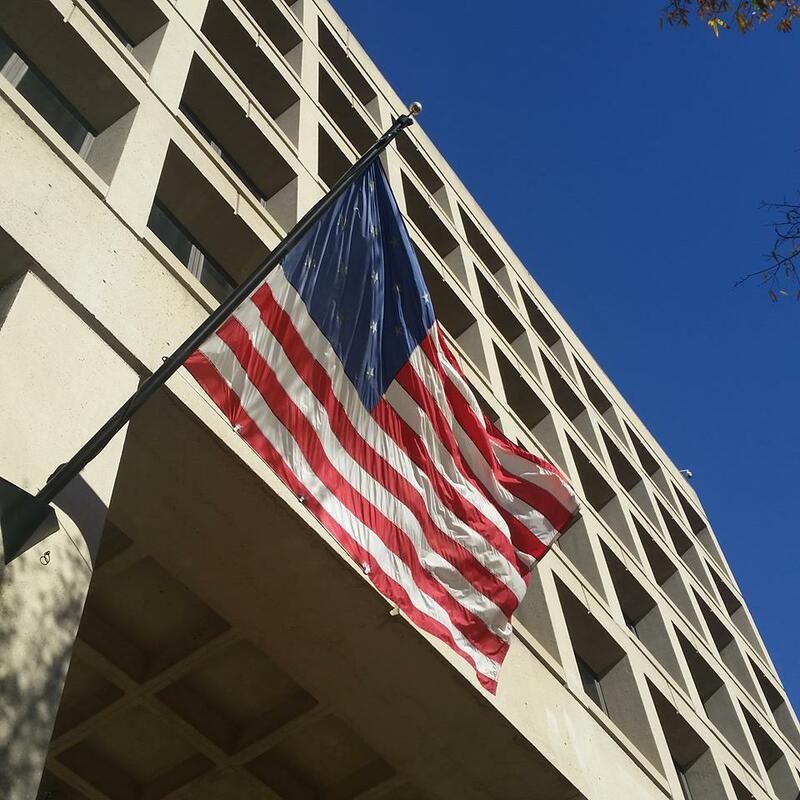 It’s the current United States flag, which the FBI’s police force reverently raises each day at 5 am and then takes down again at dusk. 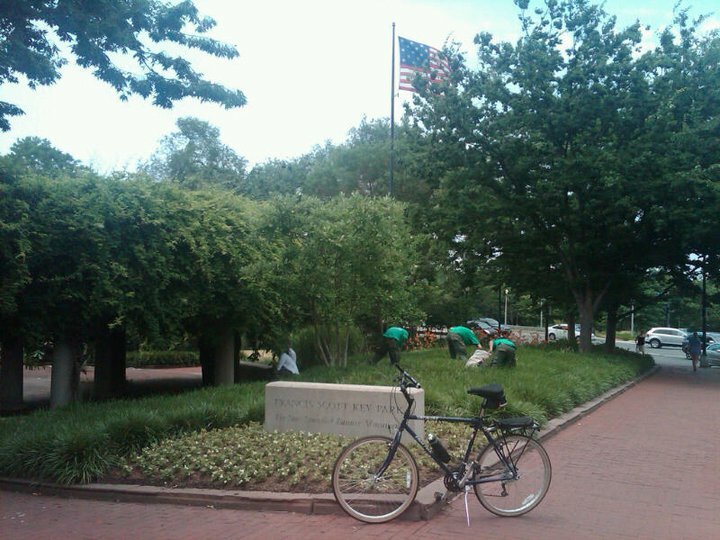 The small but formal park and memorial located at 34th and M Streets (MAP) in northwest D.C.’s Georgetown neighborhood was the destination of this bike ride. 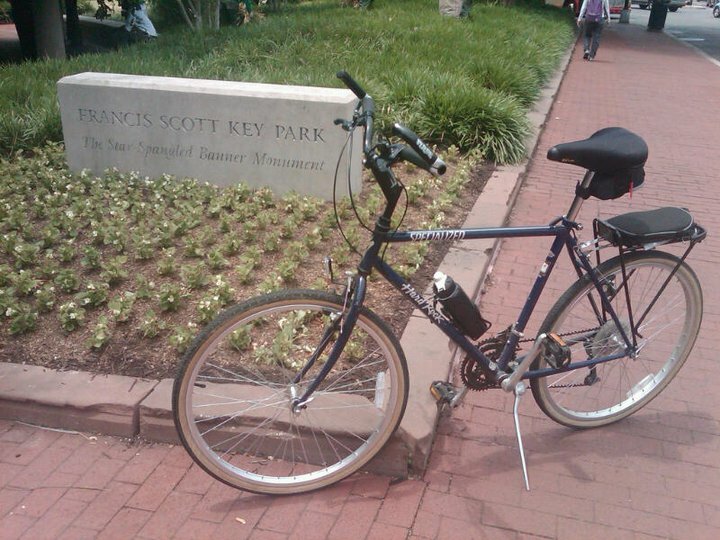 It is named Francis Scott Key Park, and is adjacent to the Francis Scott Key Bridge, which traverses the Potomac River to connect Georgetown to the Rosslyn neighborhood of Arlington in Virginia. The park honors the man who wrote the poem about the British attack on Fort McHenry in Baltimore in 1814 which was turned into a song called “The Star-Spangled Banner,” and in 1931 became our national anthem. Francis Scott Key Park features gardens with floral and other plantings, a bronze bust of Francis Scott Key, and a a tall flagpole. A flag with 15 stars and 15 stripes, a replica of the one that flew over Fort McHenry back on that fateful night in 1841, flies night and day in the park. 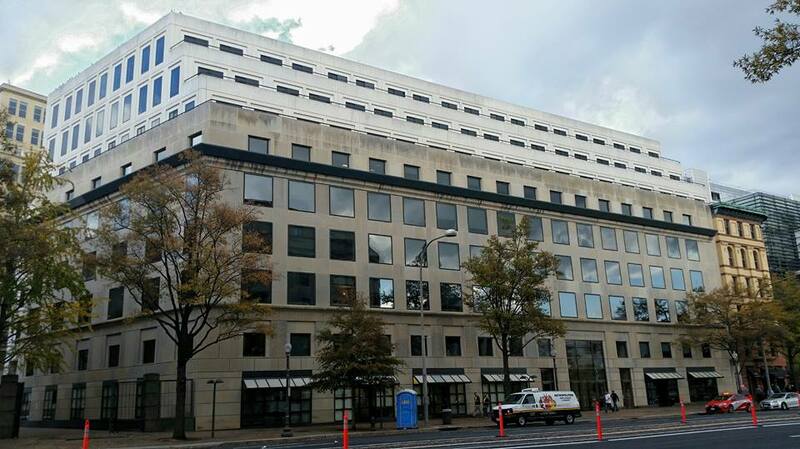 It opened in 1993, and was designed by Friedrich St. Florian, the same architect who designed The National World War II Memorial located downtown on the National Mall. Key was originally from nearby Carroll County, Maryland, where he was born on August 1, 1779. While he spent a lot of time in Baltimore, Key lived a good number of years in Georgetown, where he and his family moved in 1803. 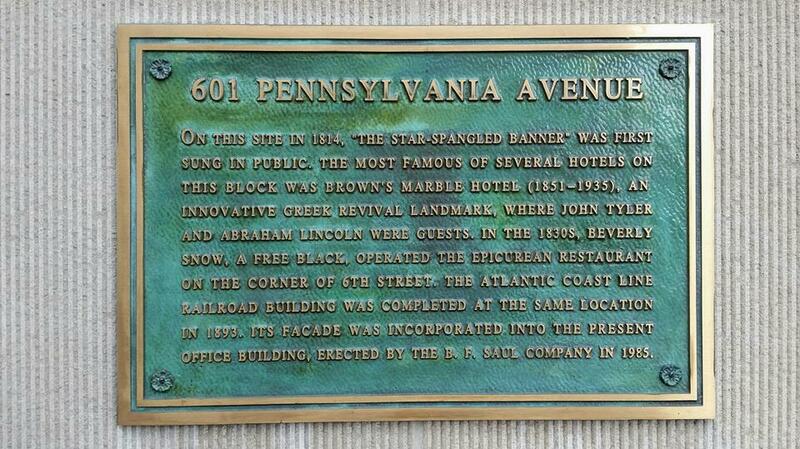 They lived in a house at the corner of 34th and M Streets, where the park is now located. Unfortunately, the house was demolished in 1947. While living in D.C., Key served in the Georgetown field artillery unit. After the British burned Washington in 1814, Key traveled to Baltimore to help negotiate the release of American prisoners. It was during this trip that he wrote the Star Spangled Banner. 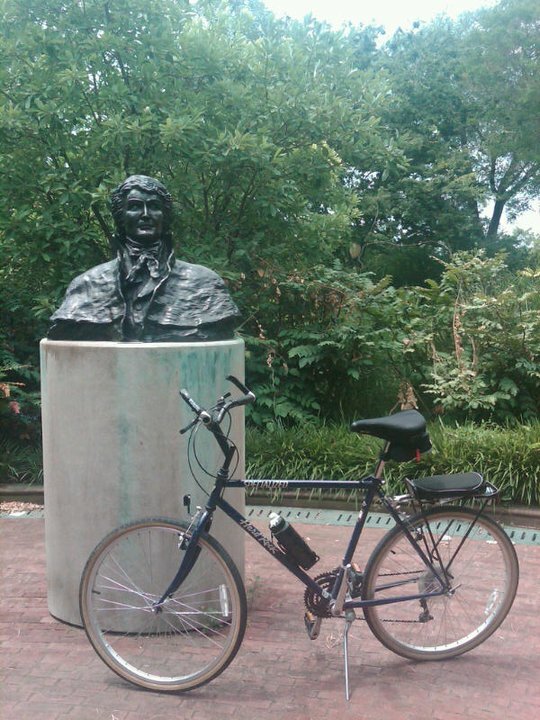 In addition to being an amateur poet, Francis Scott Key was an American lawyer and author. He was a successful as an attorney in D.C. for many years. Upon returning to D.C. after the war, Key assisted his prominent lawyer uncle Philip Barton Key, including in the sensational conspiracy trial of Aaron Burr, and the expulsion of Senator John Smith of Ohio. Key’s extensive trial practice flourished, as did his real estate practice as well. During his time as a lawyer he went on to help negotiate with Indian tribes, assist President Thomas Jefferson’s attorney general in a case in which he appeared before the U.S. Supreme Court, and serve as the attorney for Sam Houston during his trial in the U.S. House of Representatives for assaulting another Congressman. Key’s legal career culminating with his appointment as the United States Attorney for the District of Columbia, serving from 1833 to 1841. It was during this time as U.S. Attorney that he prosecuted Richard Lawrence, the person who unsuccessfully attempted to assassinate President Andrew Jackson. He also handled private legal cases as well during this time. It was also during his tenure as U.S. Attorney that Key, a slave-owner himself, used his position to suppress abolitionists. Key purchased his first slave in 1800 or 1801, and owned at least six slaves by the time he became a U.S. Attorney. Mostly in the 1830s, he represented several masters seeking return of their runaway human property. However, Key also manumitted several enslaved persons, and throughout his career he also represented for free several slaves seeking their freedom in court. Key was also a founding member and active leader of the American Colonization Society, the primary goal of which was to send free African-Americans back to Africa. However, he was later ousted from the board as its policies shifted toward abolitionist. There is much more to Francis Scott Key than most people know, just like there is more to D.C. than most people realize. Francis Scott Key Park is an example of this. And just like the man, the park is worthwhile in getting to know better.